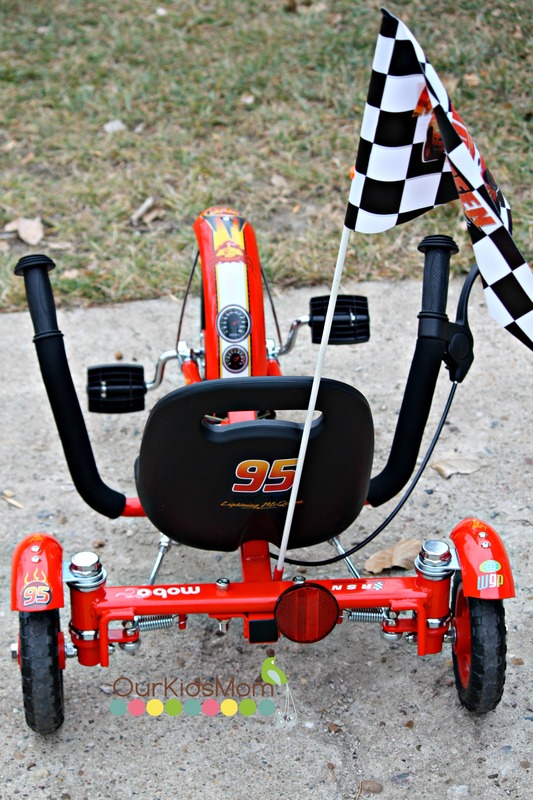 I was sent a Mobo Tot Disney-Pixar Cars Lightning McQueen cruiser bike to try out. 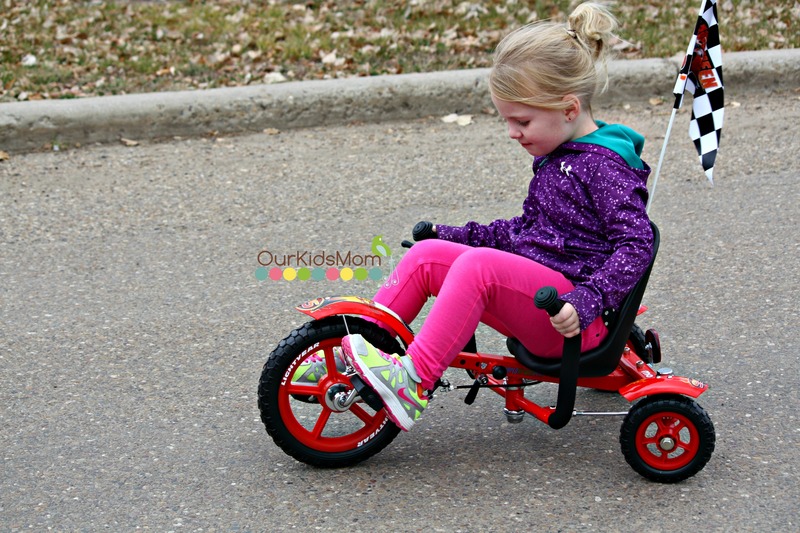 Mobo bikes are known for their high quality, durable three wheeled cruiser bikes and I knew my kids would be excited to try it out! After opening up the box there is some assembly required. It took me about 30 minutes to put the bike together as there are a few nuts and bolts that take a bit to get tight. The tools required to put the bike together do come with the bike which is nice, however there was one wrench that didn’t fit and was too small. Once assembled my kids were instantly drawn to the look and design of the cruiser. 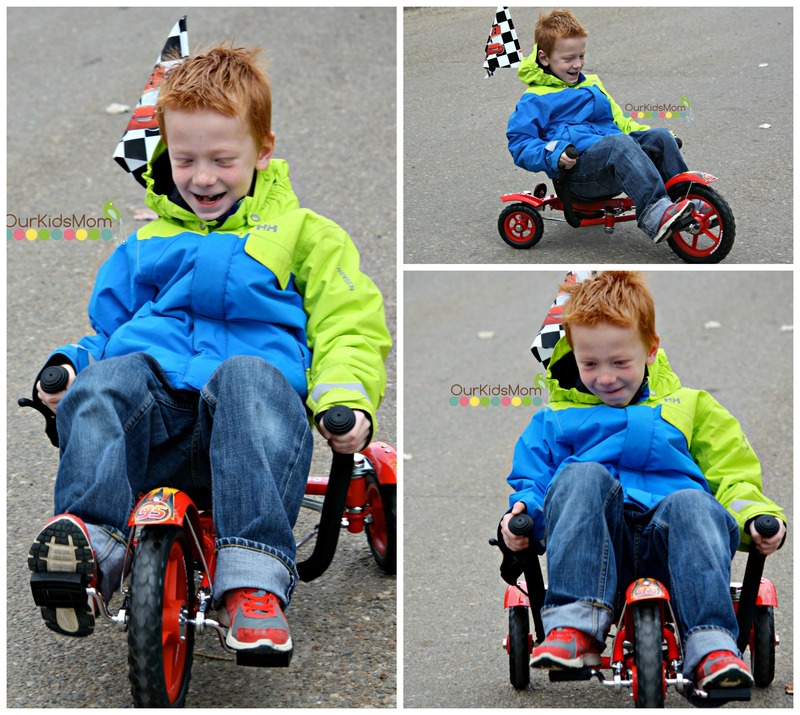 The cruiser is suggested for ages 2-5 with a weight capacity of 100 lbs. The Frame grows with your child. Pull out the side nob to adjust the length of the frame needed for the child that will be riding, then to lock it in place tighten and lock the side leaver, to ensure safe riding. I’m quite amazed at how small the cruiser goes. My 4 year old daughter jumped right on the bike anxious to give it a spin. It does take some leg power to get the bike moving. McKenna had a bit of a hard time peddling the bike and figuring it out and she ended up getting frustrated and gave up. I let my son on it even though he is 6. 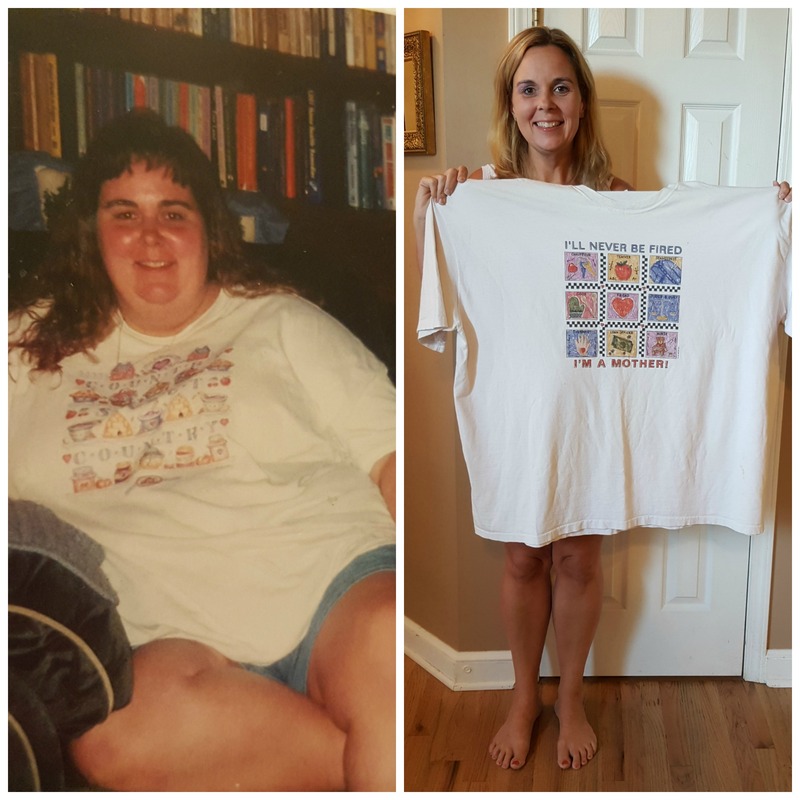 At 44 lbs. he was still within the weight limit. He hopped on the bike and off he went. Karson was all smiles as he took off with no problems down the street. There was a lot of back and forth on the street as he was figuring out the steering. Once the steering was figured out he was having so much fun doing doughnuts up and down the street. The steering on the Mobo Cruiser is a rear wheel steering system with a reversibility function. Karson has a lot of fun with the rear steering as this is a new feature for him. I can sure see how well this cruiser works on improving and developing their motor skills, while increasing arm and leg muscle strength. The Mobo cruiser is built low to the ground, so it’s super sturdy with no fears of tipping over. There is no chain on this bike so it’s low maintenance. There is a hand brake for the braking system. I love that the brake is super easy to squeeze for little hands. The front wheel I would say is about a 12″ and the back are 6.5″. The tires are a never flat tires which is a huge plus. I did notice that the “grip” on the tire to the road was a little off. Karson had a little problem with the wheels spinning when he would try to peddle too fast. 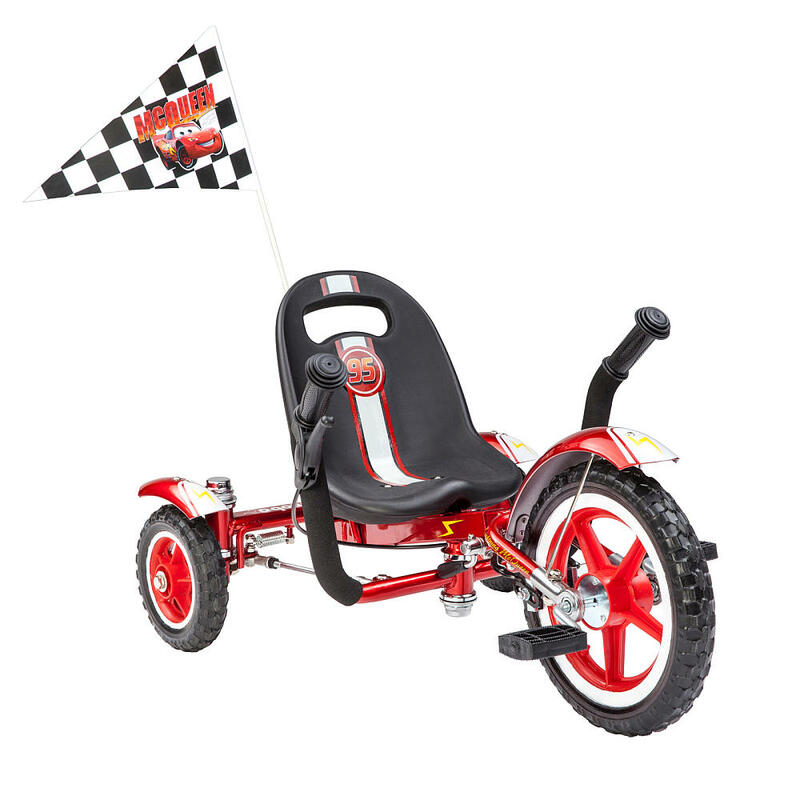 Overall I would say that the Mobo Tot cruiser is a fun new twist on kids bikes. 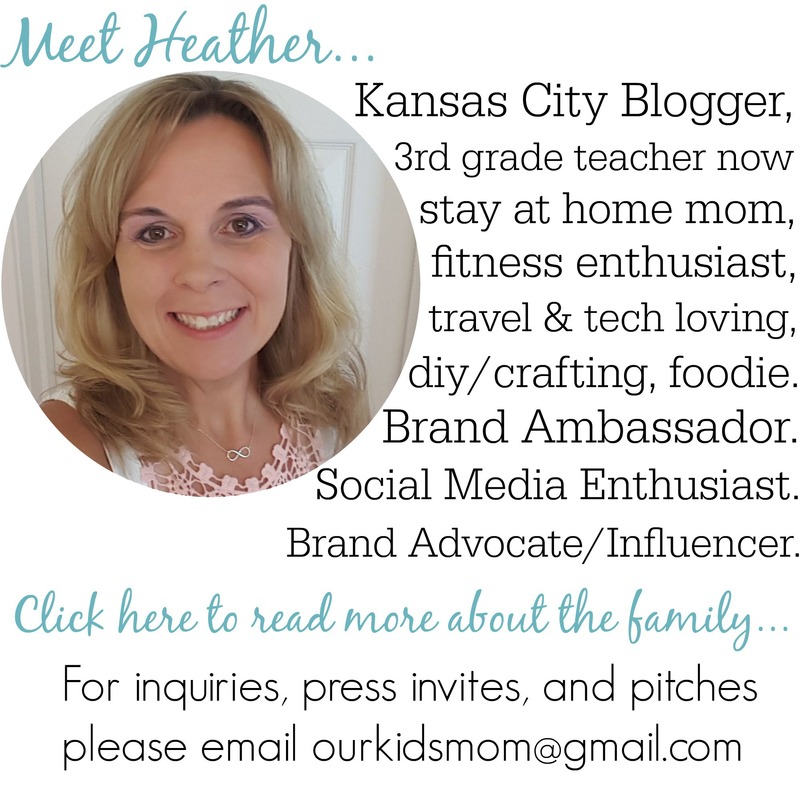 It’s sure worked for my kids to get them outside and find new adventures. As for the age range, I would put around at least 4 years old, unless you’re pushing your child on the bike or they have fabulous eye hand coordination. Head over to www.toysrus.com and pick up your Mobo Tot Disney-Pixar Cars Lightning McQueen cruiser just in time for Christmas. 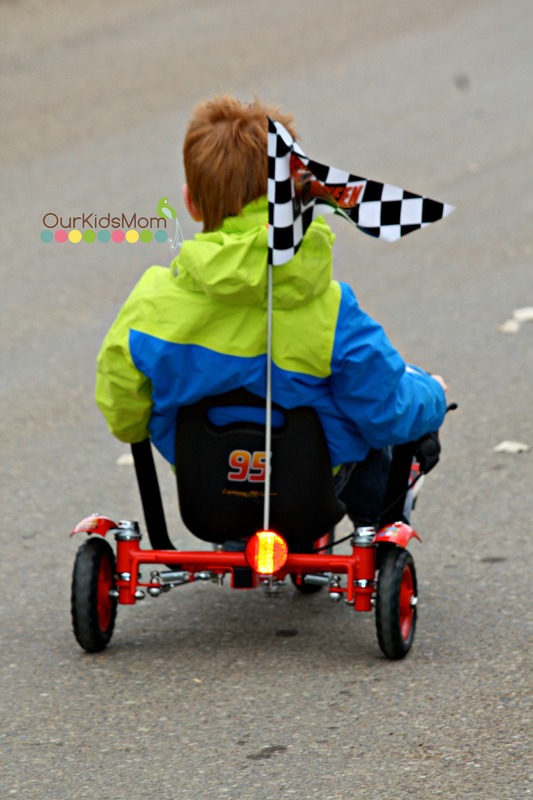 ONE OurKidsMom reader is going to win a Mobo Cruiser (bike) Disney Pixar Cars Lightning McQueen ! This giveaway ended at 11:59 PM EST on November 28, 2014. I love the toast counterweight. I watched the video and love when they make a car ramp! I also think the mandatory question was meant to be different. 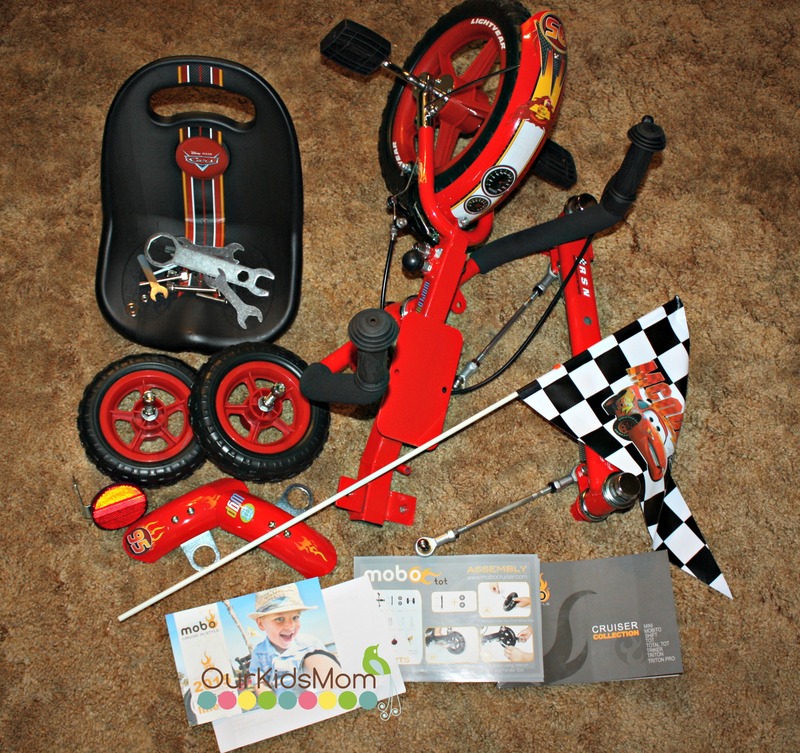 I would love to win this for my nephew and I love that this cruiser improves observational and motor skills. The car ramp is awesome, I can see my son doing that! That is a super cute video! I wonder how long it took them to build it. I like that the brake is super easy to squeeze for little hands. I’d Love To Win This For My Nephew, I Watched The Video And Liked The Cereals Being Mixed Together, Fun Creative Idea! That is a ton of cereal to have in your pantry! I feel like I need to try the mix that they poured into the contraption, cute video. I think that was a huge mess. And they needed more milk with that big of a mess. Good time spent with her dad though. I would NOT want to clean up that mess! I would love this cruiser for my youngest son. 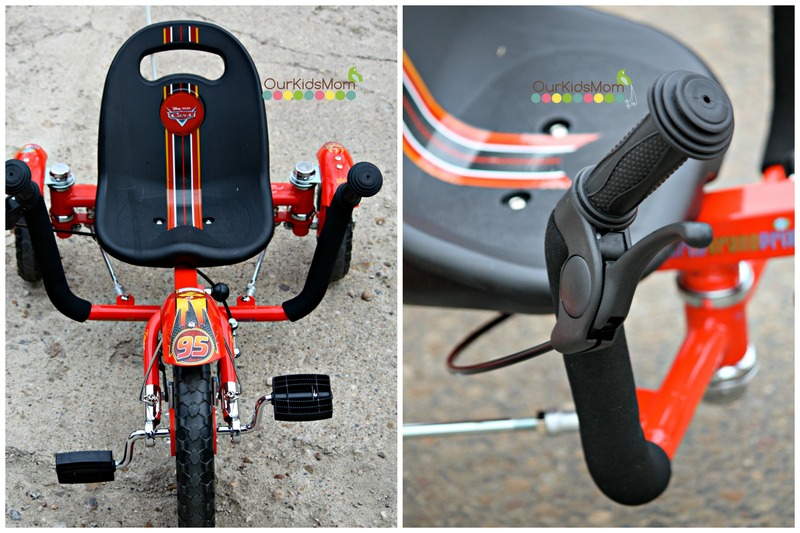 I would love to win this for my grandson – he would love riding this! Great video – quite a project to serve breakfast cereal! I like the big smiles on both their faces during the whole video. I love it! How creative! What a great way to reuse cereal boxes. Looks like a ton of fun! I learned how to make an awesome track from cereal boxes that my husband as well as my son would find entertaining for hours. What a very cool video – my son loved the car ramp! I would’ve loved doing a project like that when I was a kid! How creative. I like the ramp down the staircase. My kids would love the mixed cereals! This is such a cool video! I love it! That would be so much fun to do! Cute video… love the daddy daughter bonding! The Mobo Cruiser is so cool! I’d love to have one for my daughter and get her using muscles she never knew she had! How fun!! I liked watching the father and daughter creating the ramp. Very cool! The car ramp is too cool! That was so silly and I loved it! The toast popping out of the toaster was the best. I love this cruiser. It would be perfect for my two kids. I think it would be great for expanding their motor skills and it would keep them outside more (although, they are always outside as it is!). As for the video, they are really creative. It made me want a big bowl of cereal! I like how they worked together to create that amazing track & it went off without a hitch. I liked the creativity and fun that the father and daughter had in the video. Love the awesome video! I wish every morning could be as thrilling and exciting as that! Breakfast would never be boring! Oh the video was so fun! Reminds me of the Mouse Trap game! Carter and I would have so much fun building something like that! Loved when the toast flew up! I like how they used a car to power the contraption. I like that s there is no chain on the bike. I could so see my husband doing this! Cracked me up! Too cute! My kids loved this video. and what fun memories they are making together! They will never forget! Cute video. I never thought about making car ramps out of cereal boxes. I might have to try it. Thanks for the giveaway. I hope to win this for my granddaughter. I would love to win this for my son! The mobo mini would be great for my daughter too!! The Shift Cruiser for adults looks really, really cool! My husband and I would love to have these to take to the beach with us! 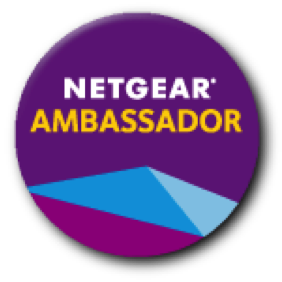 I learned that they make them for all ages, including adults. I like the Mobo 360 Degrees LED Light Helmet (Red and White) S/M size. What a very cool video, my son loved the car ramp! My husband would like a Mobo of his own, like the MOBO TRITON PRO. This would be the BEST gift for my son’s 2nd Christmas! I want a MOBO SHIFT for myself!!! I would love to have the Mobo Triton Pro for myself! ! It looks like a lot of fun. I like their new Mobo Tot Disney Frozen. Wow! I would love a Mobo Triton Pro! I would like to have the MOBO SHIFT! I have a bad back and this would help a great deal when I take the kids for Bike rides! I love that Mobo adult section says they can hold up to 180 lbs. ! The Mobo Tricker Pro looks awesome! I love that Asa Products, Inc. was established in 1998 as a Minority and Female Owned Business Enterprise in the active lifestyle market. I like the Mobo Mobito Cruiser. I watched and I like how happy they are and my son would love the ramp. I like that the brake is easy to squeeze for little hands. These look so fun! I want the Mobo Rocker in black for myself! It’s a great way to reuse products. I love that there is a Mobo Cruiser to fit every member of my family including toddlers, older kids and adults. These look like would be a blast to ride together as a family. They also look like they would be great exercise for my family. I learned that the website contains assembly videos to make it easier to put the cruisers together. I love that the innovative Mobo Cruiser from Asa Products features a unique steering mechanism and adjustable frame that makes riding comfortable and easy to ride for the whole family. I learned mobo cruiser do not require balance. What a very cool video – my son loved the car ramp. I like the helpful assembly videos. I love the idea that the frame grows with your child. plus that the brake is super easy for smaller hands! This is a must have gift for my grandson! I learned that they have a TriTon one for adults. I would love to try that out! I really like the Frozen one…so cute. My grandkids would love this. I like the new Frozen one they have too! What an inspiring post, filled with meaningful lessons.Thanks for sharing post.